For years, product managers have struggled to close the loop by updating users about the features they've requested. It's not that it was impossible to do, but the complexity of manually keeping track of who needs what (and each feature's status) in spreadsheets, JIRA, Zendesk, Intercom, or Salesforce was cost prohibitive. In productboard, you can now easily retrieve the emails of all users associated with a feature. Users may either be associated with a feature if an insight of theirs was highlighted and linked to that feature, or if you've manually scored that feature's importance to the user using People columns. Either way, you'll see all such users in a feature's details under Insights. 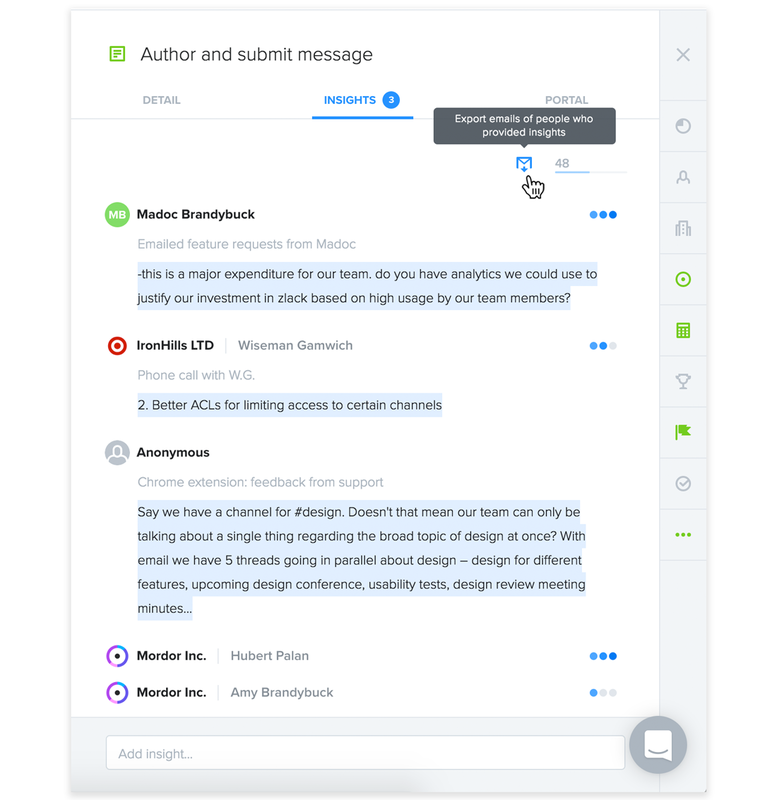 Do you use Intercom to send in-app or email communications to customers? Follow the steps below to quickly tag (in Intercom) all users who requested a certain feature. Then use audience logic to target those users in a manual message. In productboard, export the emails of all who've requested a given feature (see above). In the CSV export, add a new Tag column. In Intercom, navigate to Platform > People. Under More, select Import. Import your modified CSV: Help Intercom identify the column that represents each user's email. This is the unique identifier Intercom uses to identify that these are existing Intercom users whose records should be updated. Make sure Intercom includes your Tag column in the import. The other fields in the CSV can be ignored for now.